Divine, compassionate love for everyone. Suitable for birthdays, Valentine’s Day, and all occasions. The truest love is unconditional, gentle, forgiving and eternal. With her crown of sweetest roses, her open heart and healing hands, the Rose Quartz Angel gives you the love you seek & helps you love others in the same way. The crystal energy of Rose Quartz is infinitely soft and pure, embracing all and giving comfort, affirmation, and deepest love whenever needed. Rose Quartz is the Earth’s embodiment of the love vibration that resonates throughout the Universe. 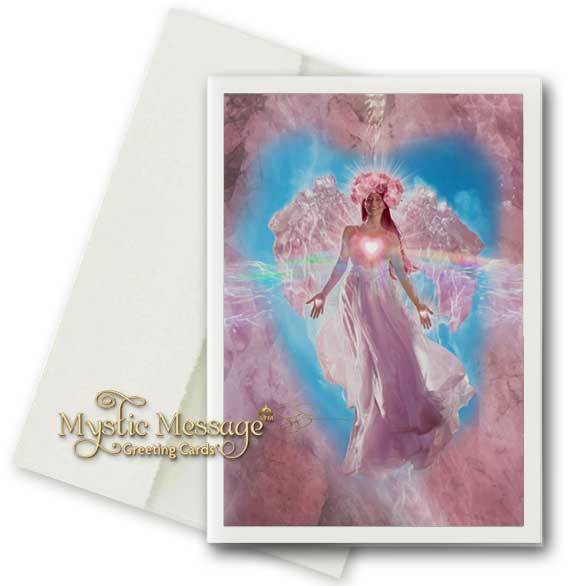 The glorious Rose Quartz Angel is the essence of Heaven, and your heart’s dearest gift of love. We’ll send you an email with tracking information (if available) when your order ships. We can ship to valid U.S. Postal Service addresses within the United States. The shipping cost is the same for any number of copies (1 – 20) since they are sent via Priority Mail Flat Rate Box.